Today I thought I would go ahead and share the new sofa with you that I ordered. for the great room. I was going to wait until I had it in the room, but heck if I know when that will be. First date was January 9, then that got bumped to February 24, and I just happened to call and check on it the other day and it has been bumped again until March 21. I am not a happy camper. The reason they are giving me for the hold up is the fabric is back ordered. Well how long does it take to get some more? This order was placed back in October. Okay I'm through venting. I wanted to show you the style of the sofa and some chairs I have been considering to go with it. Hubby's beloved leather recliner stays, but the red printed chair will leave along with the red sofa. This is the Hyde Sofa by Ethan Allen. This is shown in white from their site so you can play with fabrics on line and custom design it. I ordered mine at the store and chose Beckett Linen which is what's holding up my order. The fabric in person is not this color. It is more white. There was a sale last October for 30% off so I jumped on that deal since I know Ethan Allen is good quality and costs a bit more than I would like to pay at full price. My mom bought the Hyde sofa a few years ago and I have always loved it. I also ordered this coffee table since the deal was you had to buy two pieces to get the 30% off. Yea, they are sneaky like that. I didn't have to buy another piece of furniture though, I could have bought anything to get the discount, but I figured I could use a new coffee table to go with the sofa. I just hope I like this when I see it since they didn't have one on the floor. This red chair will be replaced and here are some chair styles below I am considering. And if money was no object I might consider this one from RH. I think I know which one I'm leaning towards. This chair will hardly be used just like the red chair was hardly ever sat in unless we had guests so I'm not worried about comfort or the light color. Which chair do you like? I hope y'all have a fabulous weekend and a Happy Valentine's Day! I'll be away the next few days so be sure to follow me on Instagram. All chair photos except for the last one are found at wayfair.com. You have my sympathies! I just found out today that the entertainment unit I ordered back in December will probably be here by Easter!!! Have you considered having a seamstress make you a slipcover for your red chair? You can find a ton of different, high quality linen upholstery fabrics on ebay. Right now there's a listing for the Suzanne Kasler natural flax linen for 15.99 a yard! I have thought about it, but I think I'm just ready for a new chair. I can get one of those chairs for less than it would cost to have slips made. You're right about the cost. We still have little boys running around, so washable is a big deal around here. By the way, I think it's awesome how you take the time to read and respond to your commenters. This blog has become a daily check-in for me! Thanks Cyndy! I am trying. looking forward to seeing your new sofa in place too. Hate it when things take forever to be delivered. Wow! That lasts one from RH is gorgeous! I'd be spitting nails if I'd been waiting that long. Have you already paid in full or anything? Geez Louise. I so feel your pain right now remembering back to when I ordered an entire family room full of furniture from Ethan Allen. Not knowing better, I gave our daughter all our old furniture before ordering, so we were left with nothing for over 10 weeks. Crazy! Your sofa choice is just beautiful and it will all be worth it when if finally arrives. My mom has the Hyde sofa and I sure hope I get mine soon. It was supposed to be 10 to 12 weeks....not months. 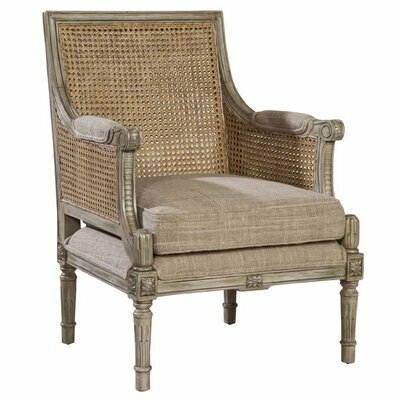 I am in love with the third chair with the 3rd chair with the wicker! Fabulous! I actually ordered two of these from Wayfair last week!!! Can't wait....hope the quality is good. I hesitated, because the chairs are only about 25 pounds...but loved the style! Oh, which one? Let me know how they are after you get them please. I used to visit Ethan Allen stores and dream. I couldn't afford to shop there and still can't. Oh a whim, I googled reviews of Ethan Allen. You probably have no recourse now, but you might want to check it out. Comment after comment just like your story and worse. Yes, I posted on fb a few days ago and lots of folks are negative towards them. I called management and that got me nowhere, too. I feel your pain. I ordered an area rug from Ethan Allen this past summer, it took 3 months! I vote for chair #4! I can't wait for the reveal! Chair number 1! :) Love your choices. Hope the wait isn't too much longer. I feel my blood pressure rising with the delivery date changing and it is not even my sofa. Sooooo not right and customer service has to mean something for a company like that. You are more patient than I am, that is for sure. I have Ethan Allen also and love my pieces. Luckily my orders came in sooner than 10 weeks! I know you are frustrated. I love chair #3. Kim, your sofa is going to be gorgeous whenever it arrives! I am going to have our red loveseat recovered. I've selected a creamy white outdoor fabric (that doesn't look or feel like outdoor fabric!) Just waiting for some moolah to fall into my lap! Definitely the cane chair!!! They're all nice, but the cane is my fave!! Love it! Love the sofa choice - it's a winner. Sure hope they can bump the shipping date for you. A f ew years ago I bought my two matching chairs and it took six months. You know, every time I look at those chairs something clicks inside me, I think they messed up their kharma taking so long and making me so mad- hope that doesn't happen for you! I bought the Chadwick sofa from EA in September and it took 3 months, and my fabric was in stock! But it was worth the wait. The quality is much better than other brands and I wait till there's a sale. Ordered end tables at end of December and received them in one month. Just ordered dining room chairs and more tables and don't expect to see them for a while but I'll take that over inferior quality. I replaced a sofa I purchased last January in just nine months because it was so uncomfortable. Live and learn, I now place quality as my number one factor, since replacing a purchase seems more expensive than paying a bit more up front. I'm sure you'll love it Kim! Cheryl, I was expecting the three months, but not the new delays and no one calls me to let me know. I have been the one to call both times. Yes, I want quality because we have a Sherril now and it is in mint condition. I am just tired of it and the color. I want a new style too. I checked our chairs from EA yesterday. Ordered the first of November. I thought, well...we are about halfway through Feb, we shall see. They will be awhile longer...a problem with getting the fabric. I know it will be worth the extra wait because EA is quality all the way. But waiting, oh my. Pat, yours are late, too and no one called you. That isn't right. The customer service lacks big time. 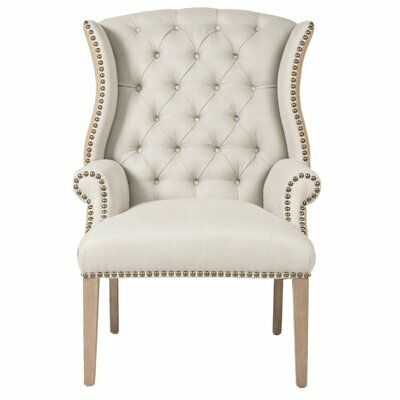 Kim, I love the first chair...that plump cushion, those upholstered sides, swoon!! Your new sofa will be beautiful when it arrives...definitely worth the wait which can become aggravating I'm sure! Yes I agree with Mary Alice, your new sofa will be worth the wait! I'd pick the Restoration Hardware chair, it looks like it will be timeless and can be used in any room if you choose to move it. I'm having the same issue with new internet. I paid and ordered the connection on October 2 and still have nothing. Let's just say I've had a few choice words with them :( I feel this type of service is unacceptable but what can we do? Sad to say I had the exact same experience with Ethan Allen and have not shopped there since. Very poor customer service. Ethan Allen is hard to beat. We have pieces that were purchased close to forty years ago. They are timeless. I prefer chair four because of the lines and height of chair back. Might add a bit of level interest to the room. That is why I went to EA. I'm just disappointed with the wait time being longer and longer. Oh my - how beautiful your family room will be. I know how you feel when waiting for something you love. Last year we were going to install new carpet in the front part of our home. We decided to pull up the carpet ourselves. When we got to the door leading to our outside patio we found mold. We had the carpet ready for delivery that next week. Everything was put on hold until 3 months later. Thank God it was in by Christmas. This was the worst disaster we have ever encountered. The one good thing that came from all of this is I realized I didn't need as much furniture - Big Plus. Have a great day & hope you receive your furniture soon. Knowing your love of French Country, I'd say #1. What fabric would you choose for the chair you pick? I don't have a fabric choice for these chairs, Betty. It is what you see. I have to tell you being a family with Ethan Allen as a number one choice in all of our homes I have gotten away form E.A years back now! Same issue on my daughters chest of drawers, 4 month wait time, and only to find when it was delivered it was damaged and off it went, they really stepped it up at at that point they were able to get a replacement in two weeks. I have now stripped it down from their signature style paint finish and painted motif to giving it my hand made paint finish changing it up from what gave it it's strong vibe of being Ethan Allen. 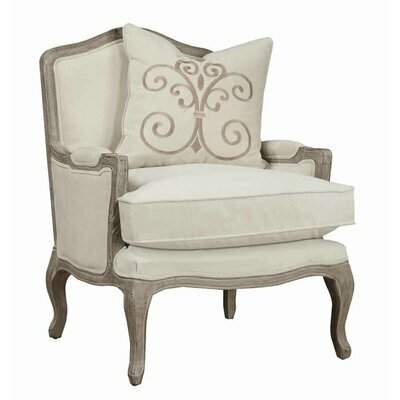 I also still have an Ethan Allen French side chair that I also stripped down to no arm pads, and repainting and aging the paint to feel less recognized and new fabric in a linen taupe fabric, but now I am ready to replace the fabric in a heaven flax of sorts. I now have rid the Ethan Allen sofa to go with a Taylor Scott from Melrose California, over Five year ago and that was a wait issue as well, the mattlasse fabric was lost coming from Europe on the boat so they said...then to wait less time second order as to 3 more months, so a temporary slip had to make due until my slip arrived, I now would love a new sofa, yet the quality and price keeps me hanging in there with this one, but a new slip would be a great up-grade to its design style and vibe I like for my home. The neutral choice in your beautiful home will be really quite a change from your strong bold country French design, to have such neutral fabrics will really allow you to play it up or down with your great stain and paint grade pieces. Loving your choice in going neutral, letting more of a rustic French stand out yet not compete for attention with each piece. The chair choices I love, but I really favor the second one, tradisctional and timeless. The Cain back chair I love, but our dry climate plays havoc on reeds and especially with companies who spray them down with a lacquer finish does not allow the reed to breathe and it just get brittle and breakage in good wear does not fair well here, unless it's of great quality where the reed can be misted down with a spray bottle of water once a month for proper care and longevity to its beauty. Yes I had two beautiful chairs as such, and in this smaller home they just were two hard for me to stress over as to who would come visit and sit in them. So the second chair would be my choice and I think it's a great chair of balance and contrast for your sofa lines. Love your Linen fabric choice, something I would so choose myself at this stage of designing. I am looking forward to your pieces in the mix of your beauty. Ps. My mothers home goes way back Country Craftman line 35 years ago of a home full of Ethan Allen... She adds new pieces here and there, and keeps it with a now look of rustic Country. Enjoy your wait, we will enjoy your new look! Thanks Dore for you info and choice. Well, I thought I would give a positive update on Eathan Allen, the first time I have ordered from them. My custom sofa ( not a quick ship) arrived 2 months early and is gorgeous! Quality is beautiful and the delivery folks offered to move the current sofa, " wherever we would like".i received 3 phone calls from them about delivery, prior to receiving it and a follow-up phone call the same day about my satisfaction. Sorry about everyone's concerns, but I am at least one happy customer. I have the Hyde sofa and love it. I have been a loyal EA customer since 1991, sometimes the quality isn't all that but lately they seem to have gotten back to craftsmanship and made in America quality. I am just careful to research where a piece is made. I have never had a negative experience with their customer service. My designer is always responsive and my wait time is never that long but I understand your frustration. If I post on their FB page they always respond. I guarantee if you tell them you are a popular blogger they will work something out with you! I like your red chair, but understand your point about recovering it. If it must go, I vote for the RH chair, I have also been a loyal RH customer since the 1990s and when they have a sale it usually makes things very affordable. Do you know anyone who works for RH? I have a friend who is a designer there and he has offered me his "special" discounts, let me know if you want a referral, since everything is dropped shipped then living in a different part of the country probably won't matter. I loved your master bedroom masculine/feminine post! Have a great weekend and Happy Valentines Day. I'm glad you are a happy customer. My mom furnished her living room with all Ethan Allen and it was early. She has the Hyde sofa too. It would be nice to get an RH chair discounted. Right now the sale is 100 off every 500 so it would only be 100 off that one. Gorgeous! You and your sister are inspiring me to get on with the sofa search. This is so pretty and elegant. Can't wait to see how it all turns out! We did our dining room 2 years ago with the help of Ethan Allen We had a bit of a wait but it was worth it. Table, 4 guest chairs, 2 host chairs and a very large wall unit for the china. Love every piece. Our designer was wonderful. We had a vision what we wanted and managed to find exactly the look. We did have great follow up calls with our designer and customer service. Your family room will be beautiful and worth the wait. Hi Kim - Have you thought about going with a Plan B at this point re your fabric choice? I have learned from experience that a delay like this that lasts longer than 30-60 days really means they may never get it in, but they will keep stringing you along until the bitter end. And you have no guarantee that in March they won't come up with another delay! I asked about choosing a new fabric and that puts me back to starting over with the 3 months again and then that fabric could be out. I'm sorry, but that is ridiculous. A customer who's been left high and dry this long should be top priority, not sent back to the end of the line. And I can hardly believe they haven't notified you of either delay. Really makes me wonder what is going on with the company. Their customer service does not match their reputation for quality. Not a good thing. The sofa looks lovely and I'm sure once it's there you won't mind that you had to wait so long for it. You are so patient Kim, I think I would cancel the order by now! But, it you absolutely love the sofa, it will be worth the wait!! fingers crossed for no more delays!! I love all the chair choices. I think I will pick the second one. I do have two of those in my family room and I have to say they are quite comfy! Have a great weekend and Happy Valentines Day! That is a ridiculous wait! Gosh, all of those chairs are so lovely! I'm curious, while watching TV - where do you usually sit? Your room is going to be gorgeous! I love Arhaus furniture too ... Have you thought about a different sofa? Oh Kim, the sofa is beautiful! It will be so worth the wait, even though the delay does seem a bit excessive. And, the chairs are all gorgeous! That's a seriously long wait! But, it will be worth it, once you have it. Most of my furniture is from Ethan Allen - they have such great stuff. All of the chairs are great, but I especially like texture of #3 and the shape of #4. Happy Valentine's Day, Kim! I love your new sofa. I hope you get it soon! What a nightmare! Patience is not my strong point and its torture to wait for something you've paid for. I bought two swivel chairs from west elm and waited 8 weeks for them to arrive! Now, curious as to what you are doing with that red chair? Man, if I lived closer I would buy it from you! It would be perfect for my kitchen! The second chair is my favorite, it's a classic. I love the cane back one as well. It's a lot more casual because of the cane, and the back will not be as warm during the winter, if that's an issue. I don't like the last two at all. The shape of the next to last one is really odd and the brass nail heads on the bottom front of the last one look like an afterthought. The second chair is also my favorite! Just gorgeous! The new couch you ordered is really beautiful too and the linen will be just stunning! Good luck :)! It's not like Kim to go so many days without an update. Hope all is well! 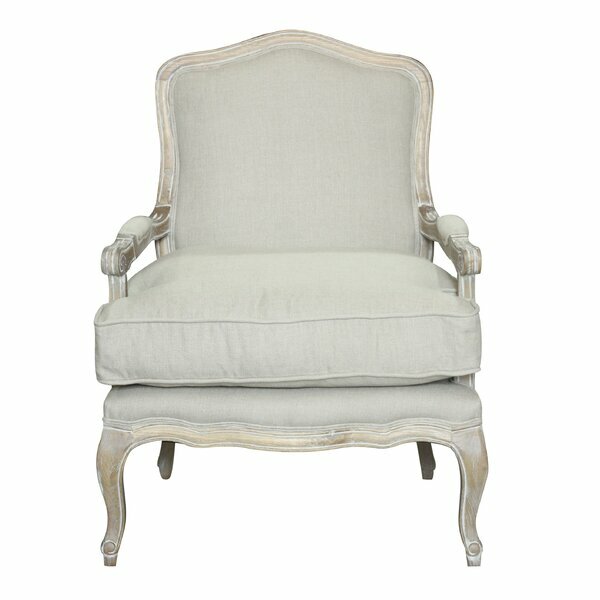 The Rodney Arm Chair is my favorite! Wow! LOVE the sofa. Fingers crossed for an earlier than expected ship. I love the RH chair. They are also fantastic to do business with. In the past six months, we bought a couch, coffee table and entertainment center. All came when they were suppose to. We caught a good sale on the entertainment center. The other two pieces not so much..but hoping this is our forever furniture. Kim, I used to work as a decorator at a store here in D/FW and my first custom job was bedding and drapes. We ordered the fabric...it was on back order, then it came in from the mill flawed and we had to re-order. The fabric got here eventually then the workroom was backed up because of the holidays. My client was adamant that her order would be there in time for a Christmas party she was hosting at her house. She was a sweet lady and ended up borrowing her friend's bedding. We started in July and it was finally finished in January. That's the caveat of custom anything...sometimes it's timely, sometimes it isn't. But it can take a ridiculous amount of time to get fabric in. Loved that job, hated those kinds of headaches.